Our drive home took 7 hours, with a stop on the M5 for lunch. You can see from the video that we enjoyed the journey as much as the time on the site. As it always does when we travel in a motorhome, it got us thinking about when we can buy our own. Time waits for no man (or woman) and my parents didn't get the chance to retire together and live their dreams, so perhaps we should do it now. Perhaps we should make the leap and take some risk to buy our own van. There's a few things we need to line up first, but maybe, just maybe, we can actually buy our own van next year. Back to crunching the numbers, checking, searching, dreaming. Life's for living. We've had a lovely, lazy day. It rained most of the night - hard - but the morning started nice and sunny. After a lazy breakfast the rain came in again, but by the time we'd washed and cleaned up it was looking a lot brighter. 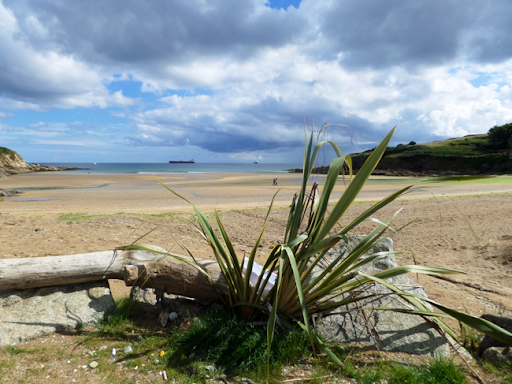 So we wandered down to Maenporth beach with our coats. 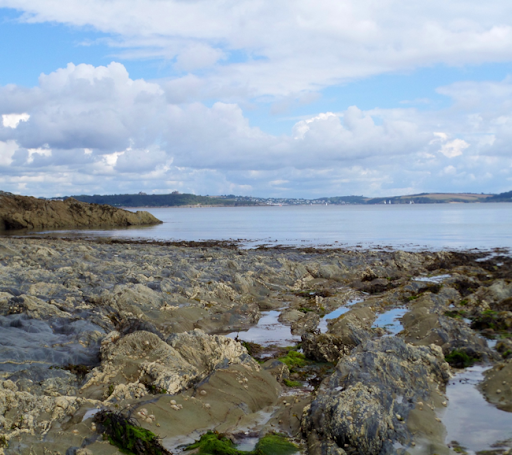 After a quick wander around the beach we headed onto the coastal path heading west. After about a mile we found a large rocky cove, with lots of open, pebbly space. We wandered around here for a while, soaking up the peace & quiet and collecting a few special stones for the deck - it's something we do at every new beach we visit! 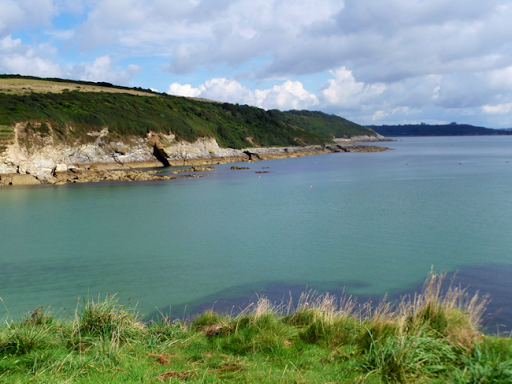 We then headed back towards Maenporth. Ready for a break, we had a tea & coffee at the cafe on the beach. Cathy had a scone with jam and clotted cream, I had a very tasty crab sandwich. 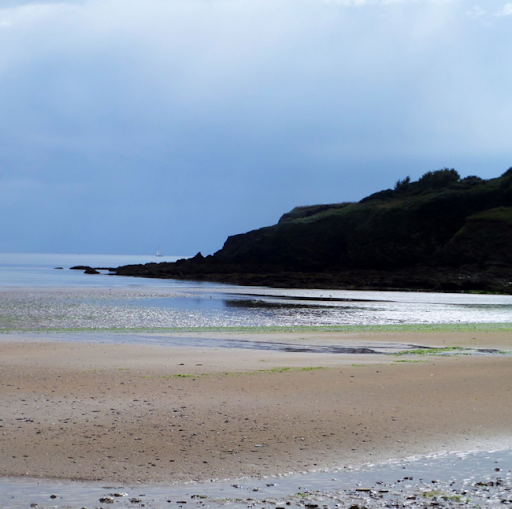 We then wandered onto the beach - the tide was out. Cathy enjoyed a paddle and I bimbled around some of the rock pools. The sun was out and it was very warm, a marked difference to yesterday (when we left the van this morning there was still a pile of ice in the grass from the hail storm). Returning to the van we sat in the sun for a while before preparing dinner. Tonight it was a ratatouille baked in the oven with chicken thighs wrapped in Parma ham, plus sautéed potatoes, washed down with a bottle of rosé. We baked some bread rolls ready for tomorrow's lunch and I went off to do the washing up while Cathy did some packing. We're now sat watching the clear sky darken, listening to some music. It'll soon be time for a brew and a read before bed - with such a long journey home we have to leave the site by 0800 tomorrow morning, so will need to be up early to empty waste, unplug, pack and head off. 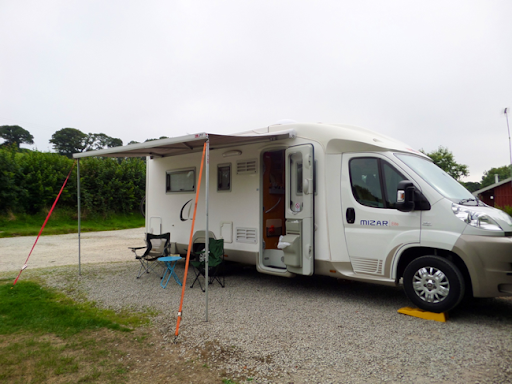 It's been a lovely break and we've quite enjoyed staying on one site for 4 nights, although we look forward to exploring more of Cornwall when we have our own, smaller van. 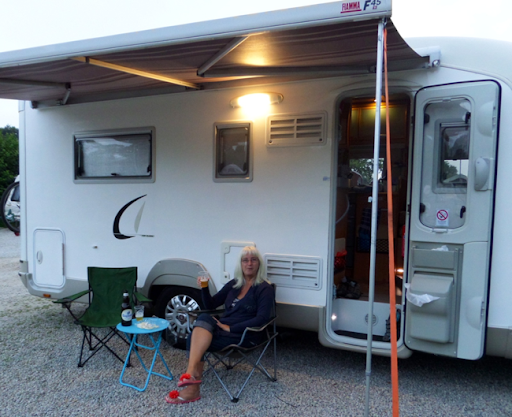 Our next motorhome trip is a long year away but we'll save up and enjoy the fortnight away in France - after all, life's for chillin'. 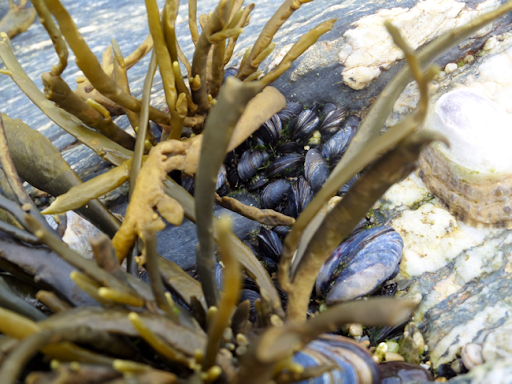 Tiny mussels - a few years and they'll be big enough to eat! 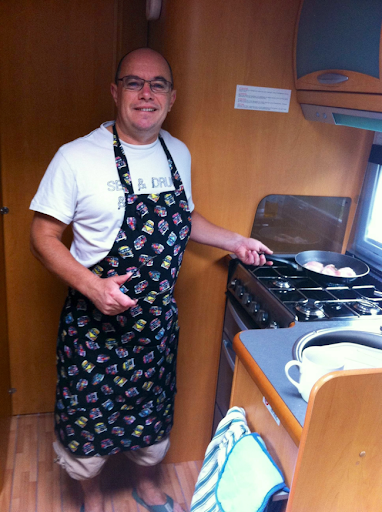 Camper van apron in use in the camper van! I've just returned from day two of the Agile On the Beach conference. All four of us (Chuck, Rob, Dan and me) really enjoyed and we have some ideas for improvements when we get back to the office. It was a lovely sunny but slightly chilly morning as I cycled the Cornish lanes to the Tremough Campus. But during the day the weather turned to heavy showers, which meant Cathy spent her day in and around the van. But she read two books, learned some more Spanish, listened to some music (thanks Frank & Mandy - the speaker's great!) and cooked dinner, so when I returned the van was lovely and warm and the food in the oven smelled delicious. 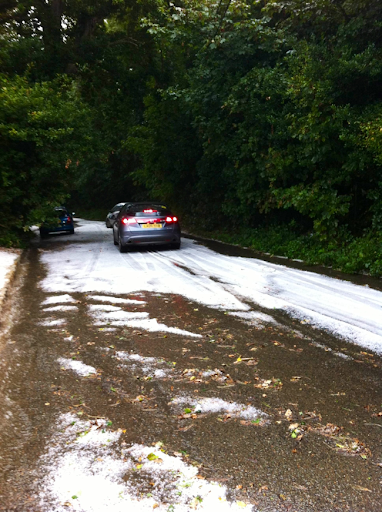 My commute back to the van was interesting to say the least. Coming out of the campus it was a lot cooler and it had clearly rained, but the roads were either gently steaming or dry. 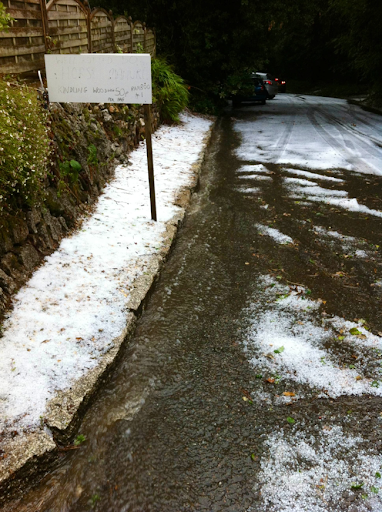 The first half of the ride was fine but when I turned off to head down the last steep, narrow lane, I could see some hail on the road. 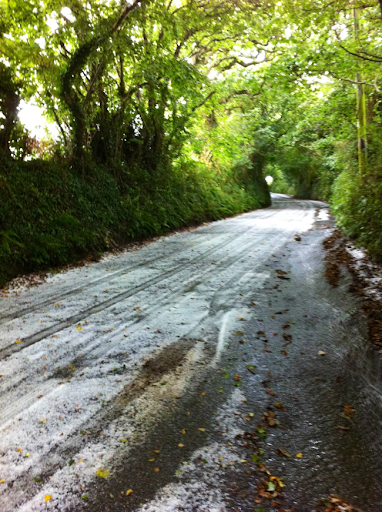 As I descended the hail was thicker and thicker, with rainwater pouring down the side of the lane. As I approached the bottom of the hill there were cars stopped in the lane that clearly were struggling to move through the ice. 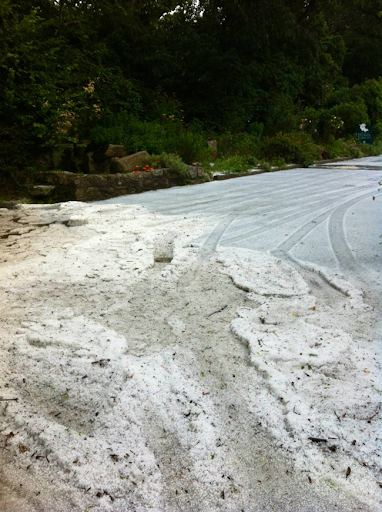 In some places the hailstones were 2cm deep and at the bottom it was at least 10cm deep, including quite a lot of water! 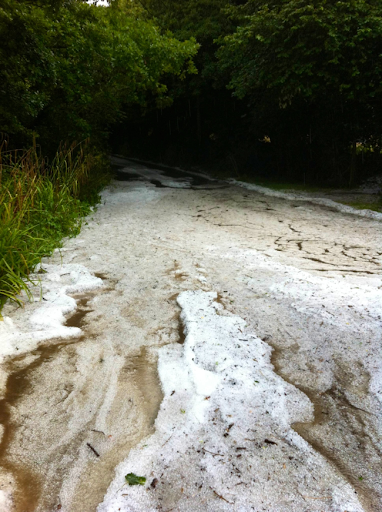 I stopped to take a few photos before carefully making my way up the hill, carefully cycling in the gully with water pouring down it. More cars were parked in the lane so I had to walk around them. 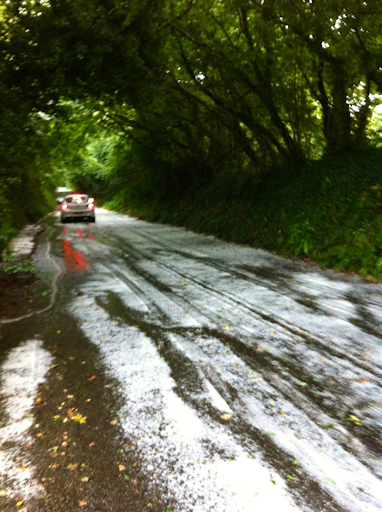 At the top of the lane, on Maenporth Road, there was a large traffic jam as cars struggled to move. On the final descent to the campsite the water torrent had washed away most of the ice, but it was still quite slippery. 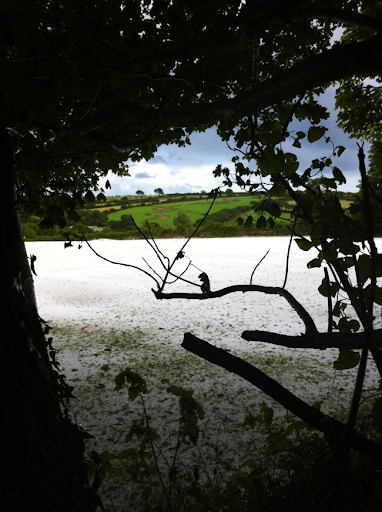 I stopped again to take a photo of the field by the road completely white, with all fields around it unaffected. Returning to the site I locked up the bike and entered the warmth of the van. We've eaten now. (Cathy did the cooking!) The starter was our own home grown, huge pomodoro tomatoes, with goat's cheese, rapeseed oil, black pepper & Anglesey sea salt. The main was a delicious stew of chicken, tomatoes, leek, red peppers, carrot, giant white beans, rosemary and hot paprika, cooked slowly in the oven. With some oven baked bread rolls and a glass of wine, it went down very well. We're now sat, feet up, glass of wine, music in the background, listening to the rain. The forecast for tomorrow is heavy showers, but I'm sure we'll head off for a walk to the beach or along the coast. I've just the washing up to do then no doubt I'll soon be asleep. Bright sun this morning, deep ice this evening - life's full of surprises. 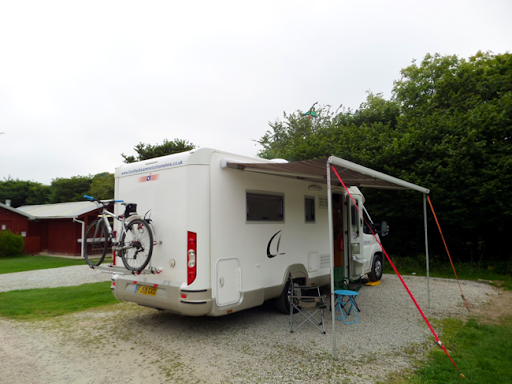 We remain parked up in the Pennance Mill campsite as we're booked in for 4 nights. This is the longest we've stayed on any site - before it was 2 nights. But we're quite enjoying putting down roots for a few days and leaving things around the van, rather than having to pack up each morning. I was up at 0630 this morning as it was a work day for me. Four of us are attending the Agile On the Beach conference at the Tremough Campus in Penryn, over 2 days. Working for a company called On the Beach, I felt we had to attend! 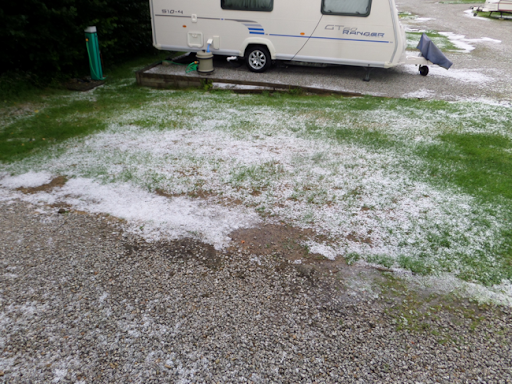 Luckily the campsite showers were nice and hot even at that time of the morning. It was a bit misty first thing, but as the sun rose this soon burnt off. I made us both a brew and had some breakfast, then packed my rucksack, left Cathy for the day and unhitched the bike from the back of the van. Heading out of the site and turning right, I immediately hit a 12% climb - not a good way to start my day! Google maps told me it was a 4.5 mile ride to the campus. What it omitted was the roller coaster ride of steep downs and even steeper ups. 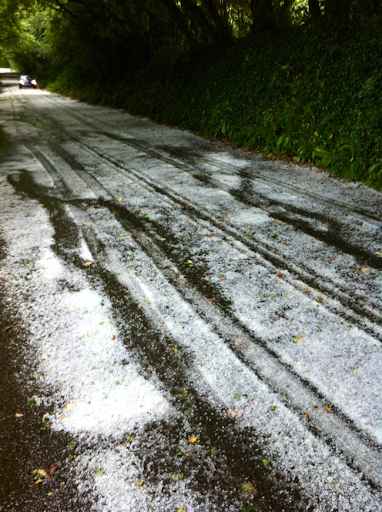 Having lived in Cornwall in the past I should have expected this, but forgot! On small country roads I had to stop a few times to check the map, but eventually made it to the campus breathless, thighs shaking and very sweaty! It was a good job I had a granny gear on my hybrid bike. After cooling down and a couple of strong, black coffees to steady my nerves (I'd had to cross the very busy A39), I enjoyed the first day of the conference. 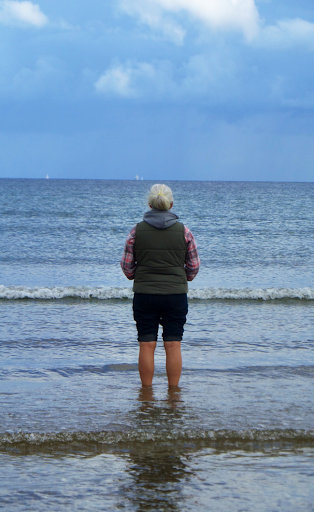 In the meantime, Cathy enjoyed her breakfast of bacon, eggs and peppers before spending the day on a sunny and sheltered Maenporth beach. Unfortunately, a 'blow out' in the bikini department meant she couldn't enjoy a swim, but she relaxed on the sand with her kindle. As the cloud cover increased she returned to the van for lunch and a chilled out day reading. 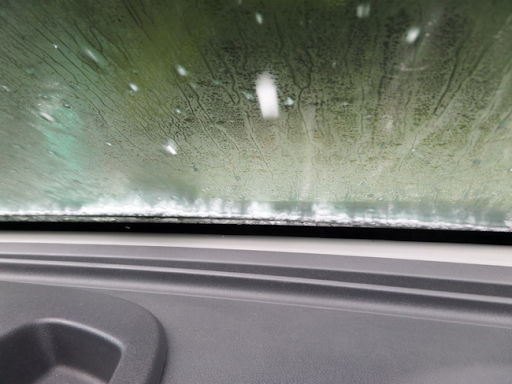 The conference finished at 1700 and I emerged to a cool, strong breeze & mizzle. The ride back was interesting on damp, slippery roads; Chuck passed me at one point and asked if I needed a lift as he was worried I was all over the road, but I reassured him I was fine and just avoiding the many potholes and gravel patches. Returning to the van, I had time for a quick brew and shower before heading back up the hill to head for Gyllyngvase beach, via Swanpool beach, for the party. Forty minutes later we headed into the marquee to get our free pint of Tribute. A few chats later, and having been 'papped' by the official photographer, we queued up and grabbed our share of the very tasty hog roast. Cathy told the young chef she had walked 2 miles for this so gained an extra ration! We caught up with the other OTB guys for a chat and a couple of beers before heading back. 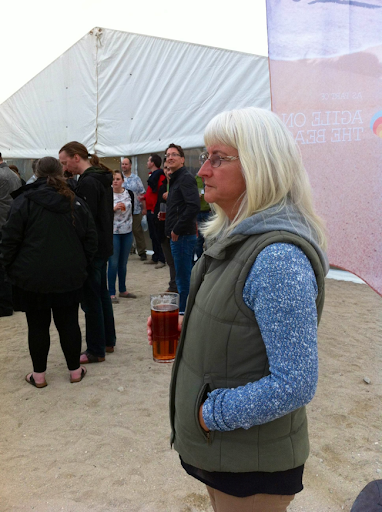 The beach party was good fun, with live music and an excellent location - I love Cornwall! The walk back was 'interesting' to say the least - very dark, small lanes with what seemed an endless stream of cars - had we stumbled on the Cornish equivalent of the M25!? After several stops to clamber up the bank and wave our torch at the oncoming cars, we eventually made it back to the van. Cathy headed off to bed, glad to still be in one piece after a traumatic walk back, while I enjoyed a glass of red wine while writing up this blog - it' a dirty job but someone has to do it. Tomorrow is another conference day for me - looking forward to it. Cathy will plan her day depending on the weather. The bike commute is tough, but if I did this every day I'd soon be fit. 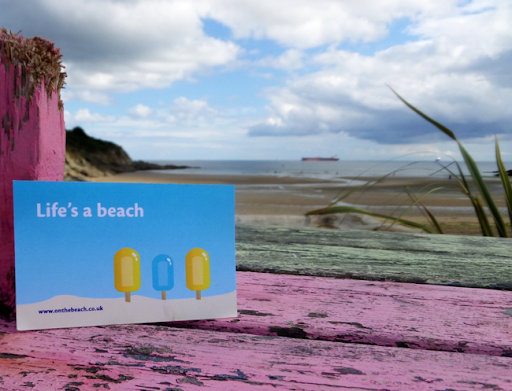 All four of us want to go back and persuade our CEO to relocate On the Beach to - well - on the beach.....Cornwall style! 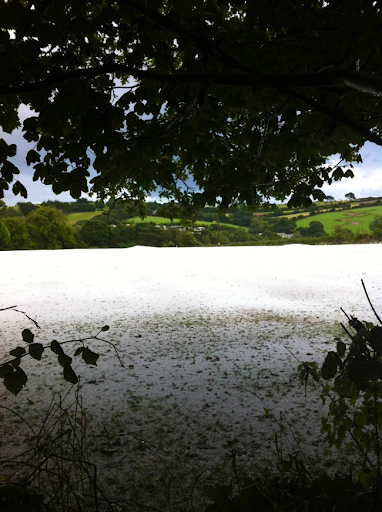 There is something refreshing, invigorating and exciting about being in the south west. Or maybe I just miss living by the sea. Come tomorrow night, I can relax for a night and day to enjoy the local beaches and seafood. I'm really looking forward to it and hope to return to work refreshed and reinvigorated, ready for new agile challenges. Still loving the motorhoming life. 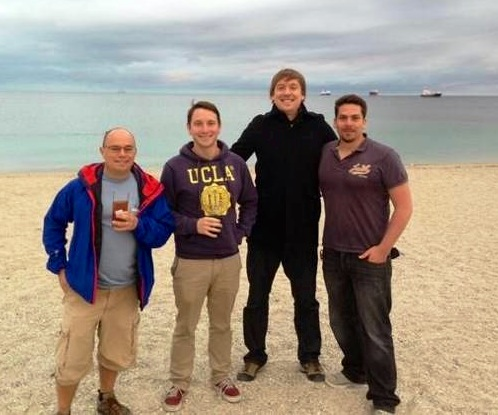 The On the Beach Dev Team - at the Agile On the Beach Party - on the beach! 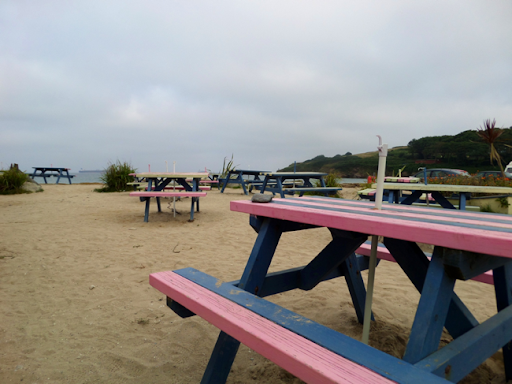 We're parked up at the Pennance Mill Campsite, about 3 miles south of Falmouth, between Swanpool and Maenporth beach. We picked up the van from Steph & Ian at Live the Dream Motorhome about 0900 and, after loading up, hit the motorways. It was a really warm day and the long, seven hour drive was only broken up by a lunch stop on the M5 and a refuel on the A30. The campsite is very quiet; clearly the families have left and so it's peaceful. Having set up, hooked up and after a cup of tea, we headed off for a walk to the find the beach. 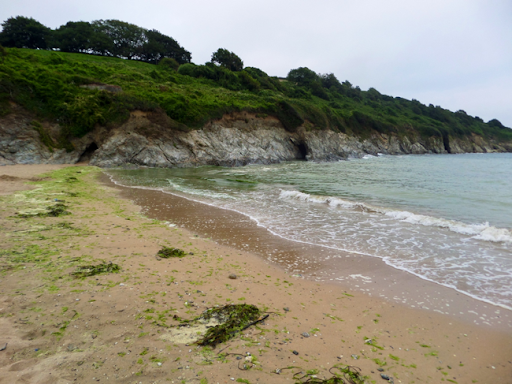 About 20 minutes later we reached Maenporth Beach, a small sandy cove with a great looking cafe, plus a bar & grill called The Cove. 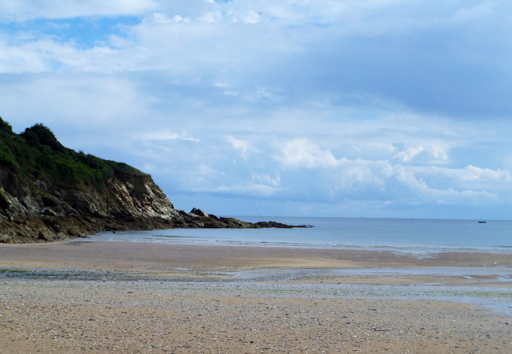 After a wander up and down the beach we took the coastal path heading north. Cathy enjoyed the blackberries and the path was lined with lovely fragrant honeysuckle. 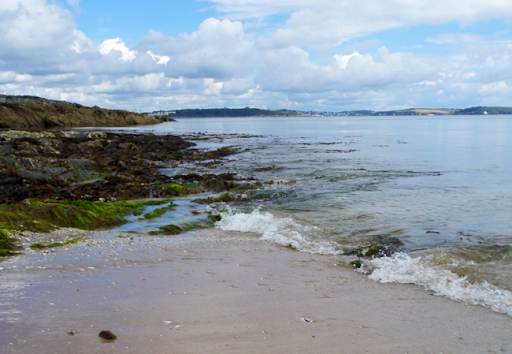 About 2 miles on we reached Swanpool beach. 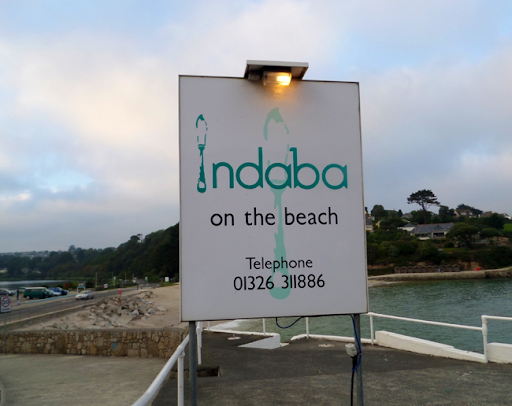 This also has a cafe right on the beach, plus a restaurant called Indaba with a great looking seafood menu - I think this will be our lunch spot on Saturday! Stomping along the small lanes, we returned to the van ready for some food and Belgian & German beer. We enjoyed this with some spring rolls and koftas, sat outside under the awning. In the meantime the curry was cooking in the oven. Awning de-rigged, we moved inside to eat. Now it's time for bed as I'm up early for day one of the Agile On the Beach conference, at Falmouth University in Penryn, along with 3 of the guys from work. It should be a good couple of days, plus I get to cycle to work, although it's a tad hilly around here. 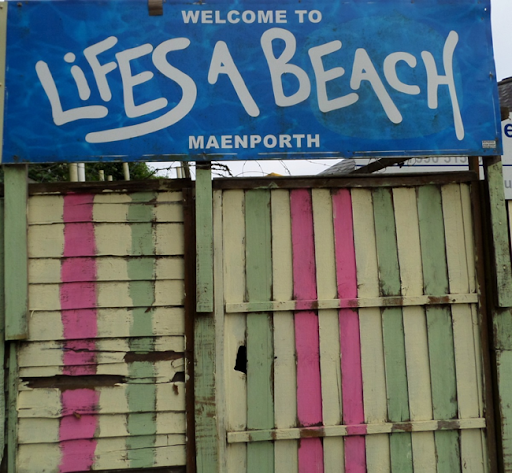 Coincidentally, most of the signs around here mention 'On the Beach' - lots of synchronicity going on. So time to sleep now after a long drive and an early start tomorrow. No doubt Cathy will have a lazy day! Above Swanpool Beach - menu looked great! 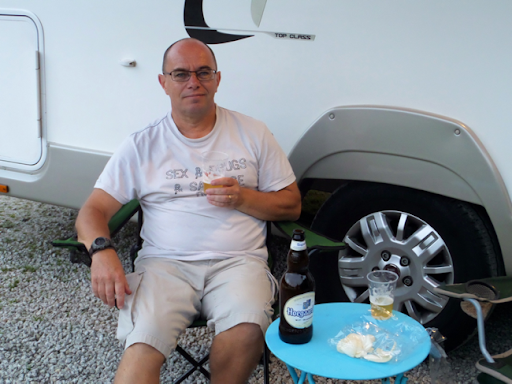 More enjoying of Belgian beer!